by the quality of care. Currently found in salons and day spas nationwide, the Sonage skincare solution achieved nationwide recognition for being effective in improving skin conditions and appearance. Extensive knowledge, years or research and experience provided the basis for the development of Sonage advanced product lines. Sonage means His or Her age in French. Ecologically aware and formulated without any unnecessary additives, these time-release products incorporate the latest discoveries and natures purest botanical extracts. Required preservatives used to maintain product purity and quality are in minimal concentration and clinical human trial is chosen over animal testing. All packaging is recyclable. 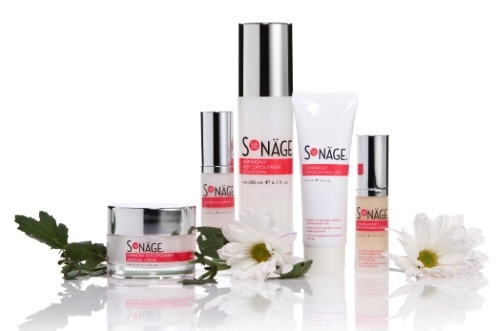 Sonage lines includes 26 professional and consumer products. Extensive knowledge, years or research and experience provided the basis for the development of Sonage advanced product lines. Sonage means e;His or Here; age in French. Ecologically aware and formulated without any unnecessary additives, these time-release products incorporate the latest discoveries and natures purest botanical extracts. Required preservatives used to maintain product purity and quality are in minimal concentration and clinical human trial is chosen over animal testing. All Packaging is recyclable.